Voters have been to the polls to elect 122 of the 123 members of Cornwall Council. Counting starts at 10:00 BST on Friday and the result will be posted on the council's website. The local authority has been led by a coalition of Liberal Democrats and Independents since 2013. One contest, in Bodmin St Petroc, has been delayed following the death of Liberal Democrat councillor Steve Rogerson. 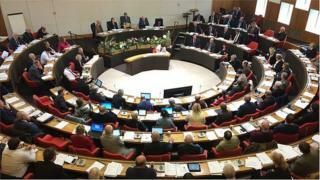 The Council of the Isles of Scilly has also been electing 16 councillors.